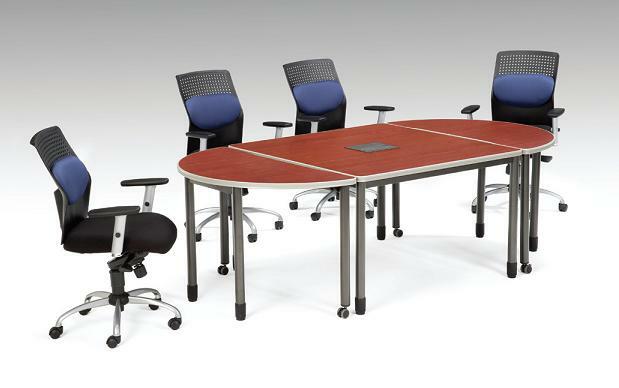 The 17-piece Mesa Series consist of desks, training tables and accessories all made from 16-gauge steel and have the same durable scratch-resistant powder coated paint finish that is on many of our best products. The 1-1/4" thick high-pressure laminate top, edged with gray 9mm t-mold banding, comes standard. Leveling glides on the round steel legs ensure a great installation. The two pedestals in the series are available in box/file and box/file/file full ball bearing suspension central locking drawer units. Whatever your needs may be, the OFM Mesa Series of metal office furniture desks, tables, and cabinets has an economical office furniture solution for your success. 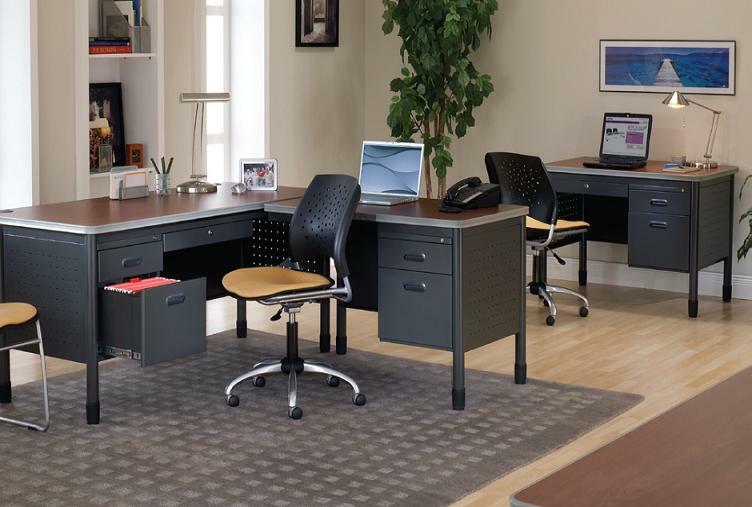 The freestanding and L-shaped desks are value engineered with features and materials to last a lifetime. The multi-function tables have matching mobile cabinets, with open and closed movable shelving. All of the Mesa Series items are In-Stock. The key features are: Locking security standard on all file/box pedestals, Gray 9mm edge banding offers extra protection, Standard locking center drawer, Hi-side and full ball bearing suspension drawer slides standard, Wire Management Grommets are built-in on most work surfaces. The OFM office furniture features modern styling for your office, utility room, or meeting area. The OFM office furniture combines clean, modern lines with stylish accents and a wide selection of tables, desks, and chairs. OFM - Model 66266 Double Pedestal Credenza 25.125" x 67"
OFM - Model 66242 Mesa Series - Sales Desk 26.75" X 42.25"
OFM - Model 66248 Mesa Series - Media Terminal / Workstation 48" X 48"
OFM - Model 66151 Mesa Series - Standing Height Training Table / Desk - Drawers 27.75" X 59"
OFM - Model 66141 Mesa Series - Standing Height Training Table / Desk - Drawers 27.75" X 55.25"
OFM - Model 66121 Mesa Series - Standing Height Training Table / Desk - Drawers 27.75" X 47.25"
OFM - Model 66150 Mesa Series - Training Table / Desk - Drawers 27.75" X 59"
OFM - Model 66140 Mesa Series - Training Table / Desk - Drawers 27.75" X 55.25"
OFM - Model 66120 Mesa Series - Training Table / Desk - Drawers 27.75" X 47.25"
OFM - Model 66510 Mesa Series - Training Table 20" x 59"
OFM - Model 66184 Mesa Series - Privacy Panel for Nesting Training Table 23.50" X 71"
OFM - Model 66124 Mesa Series - Privacy Panel for Nesting Training Table 23.50" X 47.25"